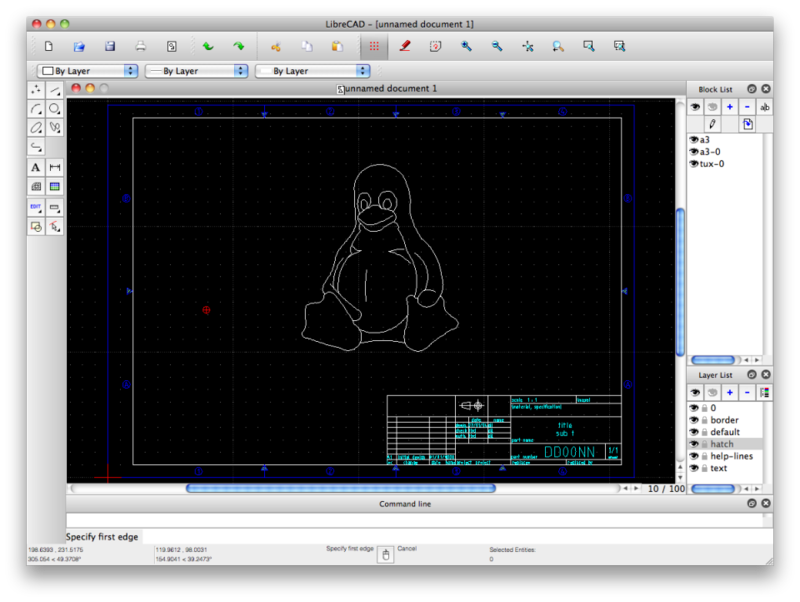 Open source 2D CAD for Apple, Linux, and Windows. Available in 30 different languages. Pros: The possibility to make a design without paying a private software for it. Librecad offer the same amount of tools that a private software, with a very more simple interphase you can draw, make measures, add text, put details on the design and of course print, you can also save on PDF version your files to share when you want. Cons: This a free software with a lot of versions and constantly updated, you have to be aware or what version you have, because ones are more unstable than others, you can also have to proof the right functioning of the software, because some versions maybe not do some task or no include another ones. Overall: In a time where we cannot afford the pay of the license of a private software, we use Librecad and the results were great, we use to design new offices and the software met the expectations, without so many tools we can do our job in a very easy way. Pros: LibreCAD it is a great option for people who cannot afford to pay for a private software to do their designs, for me this was the best option, this software brings all that you need, an easy interphase to work, all the options of drawing (lines, polygons, arch and many others), you can measure, you can adjust your design, and of course save, export and print. It is a software with the basic tools for a good design. Cons: The software can be a little unstable, in my case it brings a problem because it could never configure the print option precisely and was frustrating for me not have the change to do it and the delay my work a lot, but in the last version this problem have been solve. Another details is that is a 2D CAD software you cannot afford do 3D models or rendering. Overall: For me this was the best option for drawing and designs, because I cannot afford a private software, all the results were very good, I work with it to design a storage house and everything was ok, the only negative feature was a little unstable of the software, specially for save the files and to print, but with a little time I solve the problem. Cons: The black views personally affect my eyes a lot, it does not allow to generate a georeferencing of the realized vectors, the attributive base is nonexistent, it is a bit slow to develop a large number of vectors, it does not allow to generate 3D models. in old equipment it decreases its efficiency when the file is loaded with information. No texts exist that adapt to different scales. Pros: LibreCad is free and easy to install and stable software that is able to produce professional 2D drawing very efficiently. 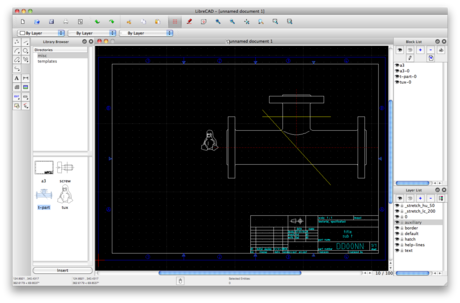 Cons: There is not much to dislike about LibreCad software. 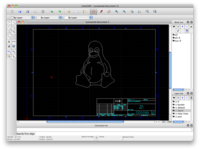 Overall: LibreCad is becoming more popular as more people discover the power in this 2D drawing application. There is a slight learning curve necessary to become proficient at the use of LibreCad, but educating oneself in a very small investment that always returns great dividends. LibreCAD is the best way for 2-dimensional design. Pros: It is an awesome software frequently used by the people. Its key features that enhances its popularity includes the options of drawing, measuring, adjusting, saving, printing and exporting designs. It is no doubt the best option for all the people who are unable to buy private software. 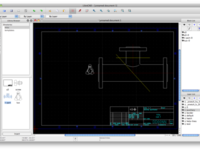 This software is an excellent replacement of the AutoCAD program. Cons: One of the con I would say is that when we want to develop large Number of vectors, it gets bit slowly. Furthermore it lacks the ability to generate 3D models due to which one has to concern other software. Pros: It is free, the tools are easy to handle, it brings the basics things that you need to do a design tool on the left, workspace on the middle and layer manager on the right, it also brings the option for export to many formats and a layout manager which can use in any printer you want. Cons: Very simple interphase, does not include many tools, you cannot also make 3D models and it has lags very frequently, and it can be very unstable in some cases. Overall: Good option but not the best one. Pros: I start using Librecad to make some changes in my house and I love it, it was so easy to use and work with it. The menus and options for drawing are very intuitive, and you can draw and edit in a very easy way, the interphase is very simple and you see what you need, like create and edite line, polygones and arch, you can do measures in only one click and save and print your design easily. Cons: Librecad only works in 2D, I do not have the change to get a 3d model of my house, another issue is that some version are unstable and have some errors, like the impossibility to print or just shut down without any warning. But new versions has solve all this problems. Overall: The possibility for make a design on my own, without paying for an expensive software. I also can help another people to do the same and make this activity one of my favorite and I can some money with it. Pros: LibreCAD is free. It is easier than most of the CAD softwares in the market and is preatty straightforward. It has tools useful for designing plans and any type of drawings at ease. Also it's interface is comfortable and fully customizable. Cons: For it's price I cant find lots of downsides to it. It is not as powerful as other expensive softwares but you get what you pay for. It can be laggy. Pros: LibreCAD brings the possibility to do designs and draws in two dimensions easily and for free, the interphase is simple and if you are not ability user like me, is not necessary to use the command bar, you can do all the draws selecting the forms and figures located on the left side of the screen, and using the layers options in the right side. All the options are so simple, and the interphase to print it is very easy to configure. Cons: The software can be really unstable and if you compare with a private software, it has a lot of limitations, becuase it does not have 3D models o rendering, and the amounts of tools is so limitated. Overall: Make designs and draw for free, without depending of a pay of a license. Pros: I can analyze the routes and condition of the petroleum pipes and looking for damage and warnings, because this software allows you to draw easily and export to image and pdf to work in the field. Cons: It is so simple, you will not find a huge amount of tools only the basics, and you can only work in 2D, forget about rendering and 3D models. Pros: In LibreCAD you can do easy designs of parks, buildings, warehouse, an so on, all this with a simple interphase, and with basic tools for draw, it has the basic tools of edition like lines, polygons, arch and measure tools, the option of print is simple and I think is a CAD for everybody. Cons: It does not have so much tools only the basic ones, you cannot manage multiple layout, it can be closed without warning and the print option works badly, it is a good option if you cannot afford a private software but is very limitated. Pros: The possibility of draw and make designs of my house for my own, without hiring and paying a professional to do that work for me, the software is so easy to use, all the tools are located in the place that you can use it without problems and create and add layers is very easy too. I only watching some tutorial videos of other users learn a lot of design and draw with LibreCAD. Cons: Sometimes the software has lags or unexpected interrumptions but this is a very common feature of free software, and another limitation can be the impossibility to do 3D models with the software. Overall: Make designs on my own without paying a professionals to do that work for me. Pros: It is a very nice 2D tool for free application, It provides most of the basic features and easy to install on your Linux favorite distribution using yum or apt-get. DXF support and auto-backup make this tool better than the average free options around. Cons: Despite the tool has nice functionality don't expect to receive more than weak support. It suffer from low maintenance and crashes often. Both its features and stability prevent it to reach the next level. Also poor online documentation does assist. Pros: Most of the software for draw an design are very expensive, so Librecad born as an alternative and make its porpuse, with Librecad I can have all the tools that a need to do a simple design in a short time, I can configure my workspace, select the features that I need (lines, polygons, arch, annotations, measures, and so on) and configure the print option through a simple two or three steps, the interphase it is simple, fast, and the software it is very leighweight. Cons: This a free software, so you will not have powerful tools for design or made 3D models, the tools of this software are basics, this is not Autocad LT, you can do simple plans, with some details, but the amount of features is limitated and sometimes the software has some lags and not work so well. Overall: Very helpful to do some specific task, but is not as powerful as a private and expensive software. Good free software for 2D designing. Pros: LibreCAD is an excellent tool for 2D designing, it is free so you wont have to pay anything and it is also extremely light, so it wont use as much of ram memory as other cad softwares. Cons: Printing with this program can be a pain while configuiring, but the biggest issue I have with it is that it does not support dwg which is the most common format for designing. Overall: It is free but it is extremely limited, and the fact that you can't use the most common drawing file DWG is a big downside for me. Pros: It was free and it is part of the Libre database of software. Cons: You get what you pay for. It is fine for messing around. Pros: It's free and has a portable version to download. Save it in a thumb drive for anytime use if you want. Cons: Lacking of some feature like what AutoCAD does. No 3D version. Overall: It is free. So, what can I say more. No complaint. It is free of computer-aided design (CAD) for 2D design. It works on the GNU / Linux, Mac OS X, Solaris and Microsoft Windows operating systems. Pros: It is available in a huge number of languages, it can be customized, copied. A large part of its interface and its philosophy are similar to those of AutoCAD, LibreCAD uses the AutoCAD DXF format to save and import files, and above all it is free. Pros: This software offers the possibility to do designs and draws in 2D, it is very easy to use, you have the tools on the left, the screen for work in the middle and the layers on the right, you just select a layer and start editing your project, the interpjase is very simple, with not so much tools and you can work perfectly if you do not need so much details in your project. Cons: The software can be very unstable, can closed without a reason, has lags, problems with the print configuration and so on, besides the designs that you do here does not have so much details, because the tools to edit are limitated. Overall: Great option for make simple designs and draws. Pros: LibreCAD, is a free open source proposal, which provides the basic tools necessary to start, has a simple user interface and has support for layers. Great for a free program but not for the serious professional. Pros: Its free. For someone who needs a CAD program but doesn't have the means to get a professional package, this may work. I definitely think there is a need for this but not for the typical architect or firm. Cons: No real support or significant user base. This package is seriously limited in its usefulness to the professional architect. Pros: This software offers and alternative to the very expensive software of designs that are in the market like Autocad, this software is very easy to use, you have the tools on the left side of the screen, in the middle the workspace and in the right side the layers that you are editing. You can do basic processes with lines, polygons, arch, and you can also make measures of every entity. Cons: This is a very basic software, you will not have hundreds of tools like Autocad and neither the possibility to do rendering or 3D models, this software is for beginners of the design work. Overall: This software only help me to do basic designs, I cannot do more than that. Pros: It is a proposal gratuite and open source for those who want to start in the world of design in a pleasant and entertaining way. Cons: The texts does not feat in the scale and the preferences must be configured after installing this software. Cons: Needs a more modern and simpler GUI, and possibly a tutorial when first opened. Overall: Pretty good software overall for FREE! Pros: This soft is easy to install (Linux Mageia 6 version) and all the functions i hope to find where present. The printed documents are OK.
Cons: It is not so simple to take into account the menus as the help is not for beginneers. Fortunately we find on internet some very easy to understand documents. Overall: You are able to draw any things with cotations.